1. Soils susceptible to potential collapse or failure under earthquake loading like liquefiable soils, clay having high sensitive and quick clay, collapsible loosely cemented soils. 3. Clays having very high (PI>75) plasticity; layer thickness more than 25 feet. 4. Stiff clays (soft to medium) of very thick (greater than 120 feet). So shear strength, resistance against standard penetration and shear wave velocity are required to classify site according to IBC. In some class like E and F plasticity index, moisture content, organic content are important though these properties are relatively simple to determine. 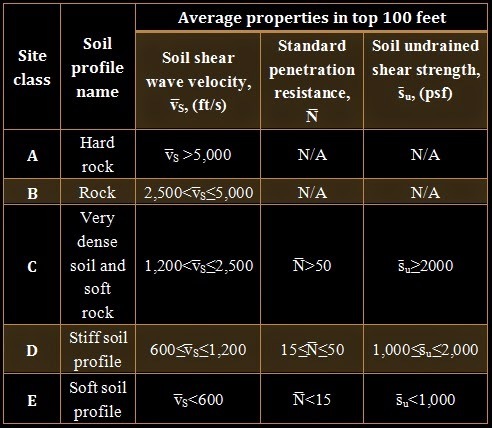 In some cases, when we have no sufficient details about site soil, it is recommended to define site as site class D. But we can assume this only when geotechnical data or building officials ensure that site do not fall in the class of E/F.